This budget garden storage shed is part of the Shed-Plus range and it stands out thanks to its tongue and groove shiplap cladding. Most sheds in the range are built with overlap which is less sturdy and more prone to warping. A pent roof gives you more flexibility in where the shed can be erected. It also ensures adequate water resistance. Another standout feature of this building is the 2 fixed styrene glazed windows. Typically sheds of this size come with just 1 window. So the building is provided with an outstanding level of light. One of the only potential downsides to this shed is the solid sheet floor. Whilst perfect for light tools or equipment, it will not stand up to heavyweight storage. Overall it is built with value for money in mind, though it does come with some pretty good features for a budget shed. Floor is made from solid sheet which isn’t suitable for heavy equipment. The pressure treated floor joists do give it extra longevity and rigidity compared to competitor models however. 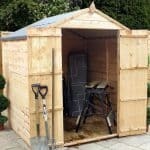 The Shiplap 7×5 Shed-Plus pent shed is built to hold general garden storage and lightweight items such as bicycles and plastic wheelbarrows. It isn’t built to withstand heavy storage so this is something you need to consider before buying. The pent roof gives you great versatility in terms of where you can assemble the building. It is especially popular for construction against other buildings and garden fences. The front height of the shed is incredibly tall, making it possible to store really tall gardening tools. It’s taller than a lot of buildings, though the other measurements are a little confusing considering it is advertised as a 7×5 shed. As you can see, the width is actually 6’6” and that’s including the overhang. The depth on the other hand is 5’4” which is obviously different as advertised too. However, without the overhang the depth is 5”1. It is still slightly larger than the 5’ advertised. Even a small difference can make a massive change to where the building can be constructed. 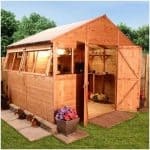 So keep these specifications in mind before deciding whether or not this is the right shed for your garden. The shed has a pent design, meaning its roof is flat and it slopes down towards the rear. This actually makes the back of the shed a little shorter than the front. Rain runs down the roof rather than sitting on top of the shed. This is one of the buildings main rot resistance features. It also makes the shed easier to erect in front of bushes, fences and below trees; giving it an advantage over an apex roof as to where you can actually assemble it. A standard green mineral felt covers the roof. Some customers have noted that this isn’t the best quality. If you want to upgrade however, you will need to shop elsewhere. Roof coverings aren’t supplied by the Shed Store. The materials used to create the roof and floor are OSB, a fairly thin solid sheet board. It can hold the weight of bicycles, plastic lawnmowers and wheelbarrows and other gardening bits and bobs. However, if you need to store heavy lawnmowers, BBQs or boxes, this wouldn’t be a good fit. It is worth pointing out that the manufacturer does pressure treat the floor joists. So compared to many other sheds with solid sheet board, this is slightly better quality. A strong, single door is supplied on the front edge of the shed, with two styrene glazed windows located next to it. Windows are often found on the sides of sheds so this is a unique highlight of this model. They are glazed with 1.5mm styrene and are 100% shatterproof. We can’t fault the type of cladding used for the interior walls. Shiplap tongue and groove is generally featured on the more expensive, high-end sheds. It is 12mm thick and has an extraordinary level of natural weatherproof benefits. Take the built in groove within the panels for instance. They have a curved, indented design which filter water away from the walls. As it doesn’t get chance to stick around, there’s a lower risk of damp problems occurring such as fungus and rot. When you compare this cladding to overlap you’ll see it is much more advanced. It won’t warp the way that overlap does. Whilst it isn’t immune to warping, it does have an additional feature which stops any alterations in the wood becoming a problem. The tongue and groove boards have a little room to allow for swelling or shrinkage of the timber. This will prevent any structural damage that can occur from minor swelling. Framing is important in any building. It’s good to see this shed benefits from a standard frame used in the majority of sheds this size. It is 28mm x 28mm thick and it is constructed from European Softwood. A dip treatment has been applied to the shed so doing it again after assembly isn’t necessary. However, it will need annual treatments. Providing you do this, the shed will qualify for the 10 year anti-rot warranty provided. Like a lot of budget designed sheds, this one doesn’t come with a lot of security as standard. The 12mm cladding is a bonus however as this is going to be hard for anybody to get through. It gives the shed a much more solid design. However, the pad bolt attached to the door isn’t going to be much use against even an amateur burglar. The good news is, Shed Store supply a free alarm padlock which will go off if anybody tampers with the lock. It also doesn’t really offer much privacy either. Although, installing curtains or a blind would help. There are four main customisation and extra options to choose from. The first is a DIY shed base. This wooden base is made from FSC certified timber and it benefits from a super-impressive 15 year anti-rot guarantee. It also comes complete with spikes which attach the base to the floor. This ensures maximum stability whilst erecting the shed. There’s an additional, fantastic benefit that also comes with this base and that is the fact that it speeds up installation. Who wouldn’t want to save time erecting the shed? 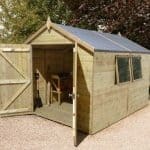 Of course, the main benefit of using this base is the fact it will prevent any potential stability problems which could occur if the shed is built on top of an uneven base. Shed Store also offer a couple of good coloured treatments. It is recommended that the shed is treated annually and the coloured options available will help to give a more personalised finish. Harvest Gold or Dark Brown are the two colours on offer and both are water based and very easy to clean if spilt anywhere. They come at a low, affordable cost but they do require annual application to maintain their excellent weatherproof benefits. The solar light is one of our favourite extras. However, you don’t really need it as the shed already comes with two large windows. Though they obviously won’t provide any light at night time, very few people will actually use their shed during the night. If it was designed as a workshop, the light would come in useful, but it’s all a matter of personal preference. The solar light is very bright as it features six LED bulbs and it is also powered by a separate solar panel. It isn’t connected to the mains and provides light when needed using renewable energy. Usually we’d highly recommend the security extras on offer. However, Shed Store give you a free alarm padlock with this building so you already have a good alarm system absolutely free. Externally this shed has a fantastic quality that’s hard to beat. On the inside however it could benefit from a few alterations; mainly the solid sheet floor could be tougher. 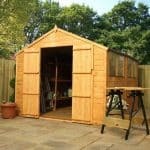 If you stick to lightweight storage, the floor of this shed should easily withstand daily wear and tear. The outside of the building is made from thick cladding, though you do need to treat it yearly to maximise its lifespan. This wide shed offers a generous amount of storage, though keep in mind it cannot hold heavy equipment. Its length will easily fit a bicycle for example and it should provide more than enough space for all of your gardening basics. This shed should take around 2-4 hours to assemble and it comes with easy to follow directions. It is recommended 2 people install the shed due to the weight of the panels. 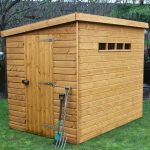 This is a great value budget shed that will suit those looking for a simplistic, lightweight storage facility. The tongue and groove cladding makes it stand out from the majority of budget sheds, making this an excellent model to opt for. 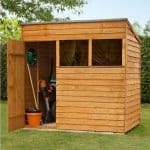 Final Thoughts: When all you need is a simple storage space, this pent shed from the Shed-Plus collection is ideal. With two large fixed windows, you can easily see what you are looking for once inside the building. Designed primarily with lightweight storage in mind, the solid sheet floor could be improved upon. However, upgrades aren’t available from this manufacturer. Its external walls benefit from great quality tongue and groove Shiplap cladding. Compared to overlap, it is much easier to install and provides more weatherproof ability. 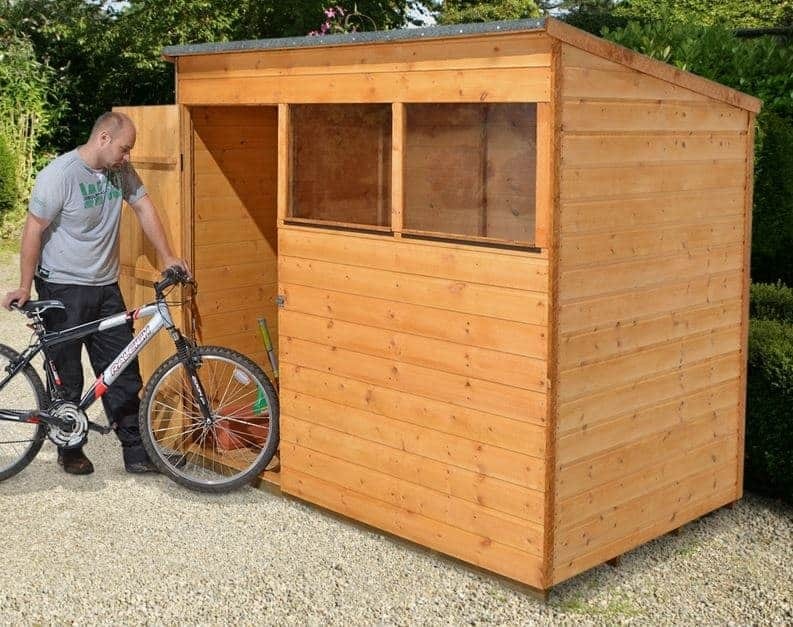 It’s a great value for money shed and the free alarm padlock supplied by Shed Store ensures your storage stays secure.